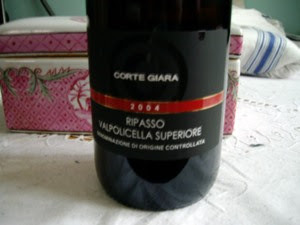 I love the Ripasso wines, with their deep red colour. The Corte Giara 2004 is has a distinct taste of red berries and a hint of licorice, providing a slightly bitter aftertaste. It worked perfect with the lamb!! Corte Giara are made by the renowned producer Allergrini in cooperation with the Valpolicella cooperative. The wine is bottled on the Corte Giara property situated in the heart of the Valpolicella region.